There are doubts over the fitness of JJ Delaney, Colin Fennelly and Paul Murphy ahead of Sunday’s encounter. 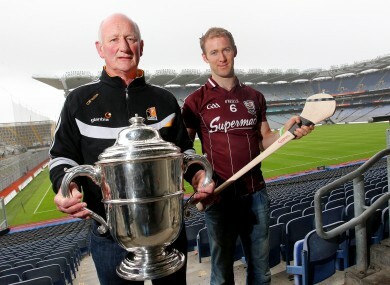 Kilkenny manager Brian Cody and Tony Og Regan of Galway. KILKENNY BOSS BRIAN CODY admits that his side have several injury concerns ahead of Sunday’s Leinster SHC final against Galway. Captain Eoin Larkin continues to be a doubt after incurring an ankle injury in training recently but Cody is hopeful that the James Stephens man will be in a position to feature. Elsewhere there are concerns over JJ Delaney, Colin Fennelly and Paul Murphy after that trio picked up knocks during Kilkenny’s semi-final victory over Dublin in Portlaoise. “Eoin went over on his ankle last week in training and he hasn’t trained since,” revealed Cody. “He did a small bit of jogging on Sunday so we’re hoping that by the weekend certainly that he’ll be fine. We expect Eoin to be okay. We have injuries, no doubt. But there’s nobody ruled out and there are definitely a few players not ruled in yet. You’d be speculating at this stage. In relation to that recent convincing win over Dublin, Cody was keen to play down the significance of Kilkenny’s victory. He dismissed suggestions that the sense of rivalry between the two sides added to Kilkenny’s desire to win. One player who has impressed of late for Kilkenny has been TJ Reid – a factor Cody largely attributes to the player’s experience at this level. However, Reid and his teammates will have to be at their very best against a Galway side who, as Cody acknowledges, will be no pushovers. “They’ve brought their abilities, their talents and the excellence of their team. When people make a list of potential All-Ireland winners at the start of the year, they’re on it. You talk about Kilkenny and Dublin and everything else, but the last time Galway played Dublin in a knockout match, a competitive match, they were excellent and gave Dublin a serious beating that day. Nevertheless, Cody will not be losing any sleep contemplating how to counter the opposition’s gameplan. While Cody recognises the strengths of Galway as a team, he insists he won’t be focusing extra attention on any one individual player, namely Joe Canning. Kilkenny, of course, have a star of their own in Henry Shefflin, whose recent return to action represented a timely boost for the side, following his spell on the sidelines. And though Shefflin’s season began belatedly, Cody feels the extra rest he experienced, in contrast to his colleagues, could prove somewhat beneficial in the long run. Email “Kilkenny hampered by injuries ahead of Leinster final, admits Cody”. Feedback on “Kilkenny hampered by injuries ahead of Leinster final, admits Cody”.